Photo banner from the Toronto Cycling Network Plan website. As part of phase two of Toronto's 10-year Cycling Network plan city planners are asking residents of Toronto to comment on the cycling draft map. Phase two input online takes place up until the end of July. You can comment of the (somewhat complicated) draft map on the city website www.torontocyclingnetwork.info. In addition to getting residents to comment on the draft map, the City of Toronto is also hosting drop-in events to meet with a City staff person to discuss the Cycling Network 10-Year Plan. The purpose of incorporating public input in the planning of Toronto's new cycling network is so that residents of the city have a say in how their city is laid out. In addition to analyzing the proposed routes residents can learn more about some of the safety and connectivity analysis that was applied to develop this map. Check out the "Studying Toronto" section of the project website. The draft map for the second phase of the Cycling Network Plan consultations does not prescribe detailed designs. For the purposes of getting the conversation started, streets have simply been identified as proposed routes on "Quiet Streets," "Fast Busy Streets" or "Proposed Major Corridor Studies." The network is presented on two screens: the first is city-wide (and does not include downtown projects), and the second is city-core (which shows only downtown projects). 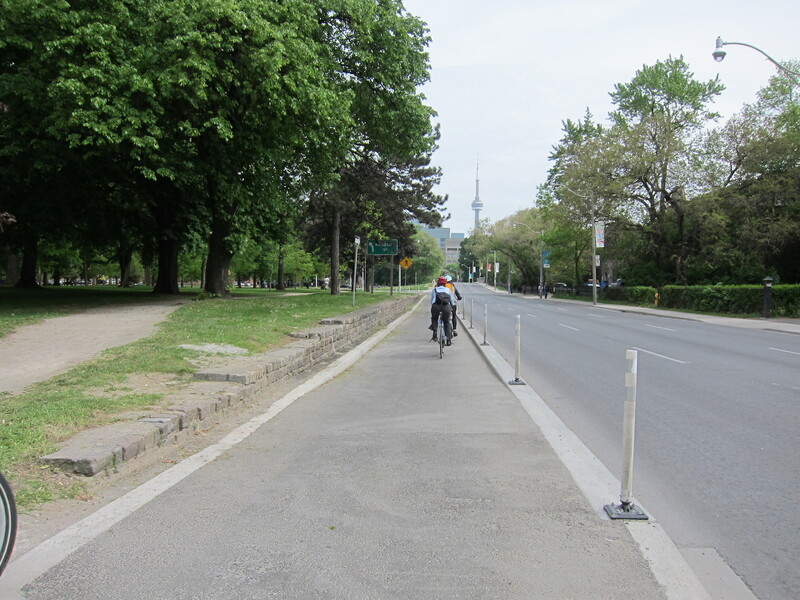 New Queen's Park protected bike lane before it was painted. Photo by Evan Morrison. Public Consultation inputs have also been used to help choose routes on this draft map: Over 10,500 individuals completed the Phase 1 survey for this map. Read a summary of the outcomes from Phase One Public Consultation on the project website. Public drop in events will take place throughout August and the information and input gathered there will be brought to City Council to be implemented in the projects over the next 10 years. Once the overall Plan is approved by Council, the city will further engage with local residents and business on a project-by-project basis, as part of the detailed design process prior to installation of each route.